The formation and development of Chinese underwater archaeology should acknowledge a controversial person named Mike Hatcher. He is a world famous salvage diver, an adventurous explorer and world-renowned treasure hunter known to many foreign governments. To the field of Chinese underwater archaeology his name equates with disaster. Mike Hatcher discovered the wreck of Geldermalsen (or the Nanking cargo) in May 1985 in South China Sea. Geldermalsen, built in 1746, was a vessel belonging to the Dutch East India Company (VOC). It traveled the usual tea trade route between China's Guangdong and the Netherlands. Besides a cargo of valuable tea the ship also held a cargo of gold and a large cargo of porcelain stored in the lower decks as ballast. In January 1752 it sank into the sea. Mike Hatcher eventually brought up an amazing haul consisting of much of the gold and over 150,000 pieces of porcelain. The ceramics originated from the Jingdezhen region, often termed the "Porcelain Capital of China" because of the area's high-quality porcelain productions. The Chinese government was shocked to learn of these treasures being auctioned at Christies in Amsterdam in April 1986. The Chinese government researched many laws: the United Nations Convention on the Law of the Sea and many other countries sea laws but officials couldn't find any reference to legally bind Hatcher to return these assets to China. There are only two articles referring to the underwater heritage exploration in the United Nations Convention on the Law of the Sea -- Articles 149 and 303. They say, "All objects of an archaeological and historical nature found in the area shall be preserved or disposed of for the benefit of mankind as a whole, particular regard being paid to the preferential rights of the State or country of origin, or the State of cultural origin, or the State of historical and archaeological origin." The rules in the law are mostly unclear, so it makes the "country of origin" can't recall their lost antiques according to the law. The Chinese archaeologists had only one choice -- to buy them at the auction. China was still a poverty-stricken country at that time. 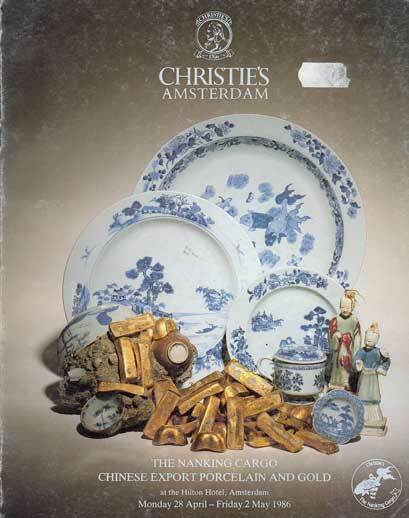 Two experts on Chinese porcelains carrying US$30,000 went to the auction in Amsterdam. More than 239,000 pieces of porcelain packed two floors of the Hilton Hotel, where the auction was held. Christies agreed to give the No.1 bidding paddle to the two Chinese bidders. But during the three day long auction they had no chance to raise their bidding paddle because they even couldn't afford the starting price. They helplessly watched more than 200,000 Chinese antiques going to other bidders. 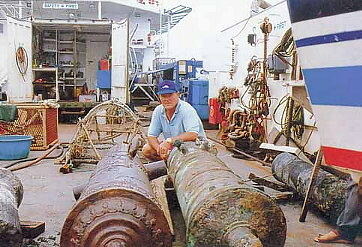 But Mike Hatcher received more than US$20 million after the auction and became the richest "salvage diver" at that time. After the heavy blow dealt by Mike Hatcher, the Chinese government decided to found a Chinese underwater archaeology team. After establishing this team, Zhang Wei started competing with all the greedy robbers salvaging Chinese marine treasures. "Although we all aimed to discover ancient relics, there is an essential difference between archaeologists and ‘treasure seekers': archaeologists seek to recover the history and protect all the ancient heritage as well but treasure hunters just want to maximize their profits," Zhang explained. Sadly, the tragedy of Tek Sing (also called True Star) proved Zhang Wei indeed to be correct. In 1999 Hatcher spent a great deal of money to hire several archaeology experts. They started to study the Dutch East India Company Archives. He suddenly found the record of the Tek Sing. The junk Tek Sing was en route from Amoy off the mainland of China to Java in 1822 when the ship hit a reef in the South China Sea. The vessel quickly sank; more lives were lost on this shipwreck than the Titanic. Hence, the Tek Sing is also called the "Oriental Titanic." The record stated: the boat was 50 meters long, 10 meters wide and when it sank into the sea it carried more than one thousand tons of cargo: more than one million pieces of porcelain. The pottery was made in Jingdezhen and included bowls, dishes, pouring vessels, storage jars, stoves, opium containers and even urinals. They searched for months. When the Tek Sing shipwreck was located they retrieved millions pieces of porcelain. The quantity and quality of the Tek Sing cargo is unusual. Most of the Tek Sing cargo was blue and white porcelain, produced by painting the decoration onto white porcelain just before the final firing that applied cobalt oxide. This method has been in use in China from the 12th century to the present day. Besides those treasures from the Jingdezhen, many other types of porcelain from some other famous kilns during Emperor Kangxi's reign (1662--1722) were located. All these antiques were well protected under the sea. The great amount: one million pieces of porcelain, shocked everybody, but they were more shocked by Hatcher when he commanded them to smash more than 600,000 pieces and only keep 365,000. Hatcher knew better than anyone else that in the world culture relics collection market, the rare things sell higher.